We welcome you to Cornerstone Baptist Church! 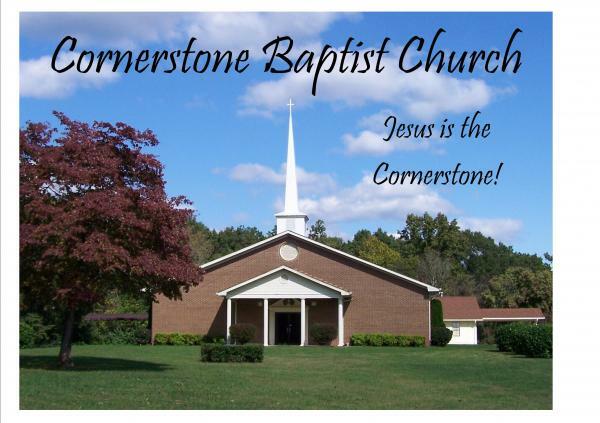 Thank you for visiting our Cornerstone Baptist Church's website. I hope that you enjoy it. As Pastor of Cornerstone I want you to know what our church is all about. We have two basic goals at Cornerstone. We want to share the good news of Jesus Christ with people and we want to help them in their spiritual growth. I believe that it is the word of God (The Bible) that offers the key to accomplishing both of those goals. This is why all of our preaching and teaching is based solely on the Bible. I personally use a combination of expository preaching (verse by verse) and topical preaching (topic by topic) in order to teach God's word. It is the Bible that can change a person's life and all of our ministries here are centered around God's word. Our ministry is focused on meeting the needs your entire family. We have children's and youth ministries on Wednesday night and on Sunday morning. We have small groups studies for our adults on Wednesday night and Sunday morning as well. We are a very active church having different social events all year long. You can check out some of these in the photo section of this website. I hope that you will take the time to come and visit us here at Cornerstone. We have many opportunities for service and the use of your spiritual gifts in our church. If you have a need that you would like for us to pray about, feel free to forward that prayer request to us. We would be glad to pray for you. If we can help you in any way, contact us and we will do our best to help you. Sunday Mornings: We are studying through the Book of Galatians. Come find out how to live the Christian life. Sunday Evening at 6:30 pm. We are studying through the Old Testament chapter by chapter.